His first taste of a major league diamond. Back when I talked about Prospect Week at FanGraphs, I mentioned that I could write about Vladimir Guererro Jr. all year. Well, here's one of those articles, as he has been making some noise in Spring Training and is pushing to finally make his debut in the MLB after signing as a 16-year-old for $3.9 million. It feels like he has been around forever because he signed so young, but he is meeting and surpassing all challenges thus far in his young career. Here is why he's ready to take on his next challenge, debuting in the MLB as a 19-year-old. Let's start by making the case against him. The realistic time of arrival would be in 2019, where he will be 20 years old and have a bit more seasoning under his belt. It's likely that the plan was always to have him up next year, where the team currently doesn't have a third baseman under contract. Thus far, they have been playing him alongside fellow top prospect Bo Bichette, where they have moved up levels together and are slated to begin 2018 in AA with the New Hampshire Fisher Cats. The number one argument against Vlad Jr. making his debut in 2018 is service time. If the Jays wait until around May of 2019, they will gain an extra year of club control, and that extra year will come during his prime years. If he accrues more than 172 days of service time in 2018, he would become a free agent at the age of 25. We can completely rule that out, as there is no chance he would make the Opening Day roster, so the question becomes can they wait until May of 2019 to bring him up? In theory, Vlad's age 26 or age 27 season will be better than his age 19 or age 20 season, so in order to gain the most value over the course of his first six years, it makes sense to hold off as long as possible. There has been a lot published on the service time issue, and it could be changing within the next CBA. Sheryl Ring wrote about a possible legal case against service time manipulation, and it will no doubt be a major factor in the decision on when Guererro Jr. will join the Toronto Blue Jays. The second argument against him debuting in 2018 is related to his work in the field. The general consensus among scouts is that his bat is MLB ready now and that his development with the glove is what would prevent him from making the leap. He is currently playing third, but based on his body type and glove work some scouts see him taking a Miguel Cabrera or Edwin Encarnacion-like path in the majors. Obviously, third base is currently blocked by Josh Donaldson, so if he were to be called up (barring an injury or trade) he would likely be shifted to first base or designated hitter. Those positions are currently held by Justin Smoak and Kendrys Morales, so there are currently roadblocks to playing time at every position. It's important to keep Guererro getting reps in the field if they seriously think he can be a major league caliber third baseman. I'm skeptical he sticks there long-term, but if they think he has a shot it is important to give him every opportunity to improve and bringing him up to be a designated hitter could potentially negatively harm his development in the field. Alright, so after outlining the reasons why he shouldn't, and likely won't be called up this year, it's now time to get hyped. You like power? He's got power. HYPE. The Jays are incredibly lucky to have two potential game-changing prospects coming through the pipeline. I'll include Alford in this because he does have elite upside, however, injuries have been a concern so far despite progressing quite a bit after being a D1 NCAA football recruit. I can buy into the theory that it makes sense to try to wait for Bichette, Alford, and Guererro Jr. to all emerge on the team together in 2019. I just firmly believe that Vlad is a clear tier above both of these guys, both in development and the ability to make an impact this year. Let's take a look at his stats over two levels last year. So you're telling me that in A ball, he had 40 walks and 34 strikeouts than maintained that in A+ with 36 walks to 28 strikeouts? That's insane. A power hitter almost never walks more than he strikes out. Showing that type of advanced plate discipline at such a young age is so impressive, especially when you look at his above-average ISO of above .160 in both years. That means he's not selling out for power, it just comes naturally with his swing. His ability to continue dominance with that kind of profile as he moves up levels makes me think his bat would be able to translate to the majors right now. Alright, now let's take a look at another uber-prospect, in Atlanta Brave Ronald Acuna. He's widely believed to be called up after April, once the Braves can assure another year of service time. He's the #1 prospect in baseball, and other than Ohtani is the only one ahead of Vlad on any updated prospect list. He is in his age-20 season but has absolutely raked in every level of the minors. Important to note as well, is that Acuna is a 5-tool player so he is a plus defender in the outfield and also has speed, so he is not so reliant on his bat to be successful in the majors. He has other ways of contributing and is sure to be a key piece on the next contending Braves team. Right off the hop, I'm hurting my case for Vlad Jr. to be up in 2018. Acuna is one year older, and flew through the levels in 2017, starting where Vlad finished and destroying AA and AAA. One interesting note about Acuna is that he has improved his OPS at every level he's played at, including the AFL and Spring Training this year. At some point that's going to stop, but if he manages to do it this year in the MLB that that would be almost unheard of. This is probably the most likely scenario for Vlad, where he starts at AA and gets a mid-season promotion to AAA. Again, it's all about service time, so it ends up adding an additional factor when making these decisions. The MLB rewards teams for keeping their prospects in the minors longer. Let's get back on track here, as I want to make the case for Vlad Jr. to make the team in 2018. To do so, all we need to do is look at a best-case scenario: the 2003 World Series Champion Florida Marlins. After finishing last in their division in 2002, they made a few moves in the off-season, signing Ivan 'Pudge' Rodriguez as a free agent, and trading for lead-off man Juan Pierre. Arguably their best move, however, was calling up a 20-year-old hitter from AA: Miguel Cabrera. His first ever game? Yeah, not so bad. Miguel Cabrera is the best hitter of our generation, though I'll give Albert Pujols a bit of love here. It is a stretch to compare Vladimir Guererro Jr to Cabrera. But I'm not the only one doing so. Here are two money quotes from a Baseball America roundtable from Matt Eddy and JJ Cooper. Matt Eddy: As to Guerrero, I think he is so advanced offensively that he will reach the majors as a 19-year-old in 2018. I would bet that he won’t even be eligible for the 2019 Prospect Handbook because he will have too many big league at-bats. That’s because Guerrero has proven to be the rare prospect who is even better than advertised with the bat. The top prospect on the international market in 2015 and the No. 1 prospect in the Rookie-level Appalachian League in 2016, he surpassed expectations in 2017 by acing two Class A levels with a .323 average, 13 home runs, a .425 on-base percentage and more walks than strikeouts. At age 18! J.J. Cooper: Matt, I agree that Guerrero is the one of these three who has the highest upside. If he doesn’t exhaust his prospect eligibility this season and produces the same kind of numbers in Double-A and Triple-A that he did in 2017, he could be a 75/Low or even the impossible 80/Low in our BA Grades next year. Hitters just don’t do what he’s done at his age. Guerrero could have a Miguel Cabrera/Albert Pujols-level impact at the plate, which makes me really care little about where he plays defensively, but his ability to stay at third base for now is a nice bonus. In the current Jays line-up, Vlad Jr appears to be blocked. Justin Smoak is coming off a 38 home run season, and there is no chance he forces Donaldson off of third as long as he is a member of the team. For this year, it would appear that it would boil down to Kendrys Morales, and the Jays have $11 million reasons to keep Morales in the line-up. The team is currently projected at 86 wins, which puts them among a group competing for two wild-card spots in the American League. Guerrero Jr. has the potential to be a true middle of the order impact bat, and that's something the team could use during the playoff stretch. A small upgrade might be all it takes to be a playoff team. The most likely scenario in which Vlad comes up this year is a Smoak or Morales injury. Another scenario would be if Morales continues to be a below replacement player. If Donaldson is injured or traded, then the playoffs seem unrealistic anyway, and there would be no point to start Vlad's service time clock if they are out of contention. Once Vlad is up, he won't be sent back down. What it's all going to boil down to are these questions. Do the Blue Jays value an extra year of service time for Vlad, along with continued defensive development, over than the potential upgrade in the 2018 line-up? 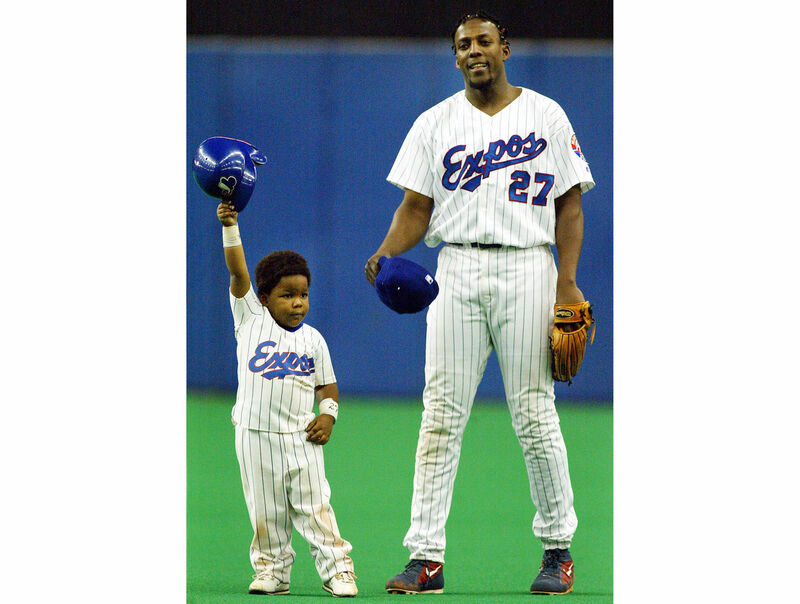 How much of an upgrade would a 19-year-old Vlad Jr be? It's a good problem to have, and Ross Atkins and Mark Shapiro have shown patience in developing prospects. Regardless, there is a strong case that Vladimir Guererro Jr. is MLB ready and would be able to make a contribution in 2018. 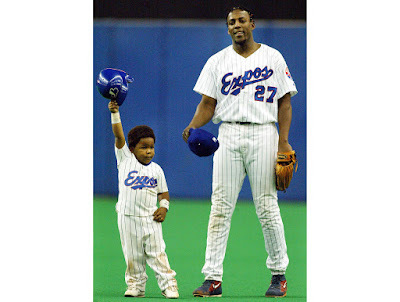 Vladimir Guerrero Jr. DID IT AGAIN!! He hit another massive, absolute no doubt home run during a minor league spring training game today!